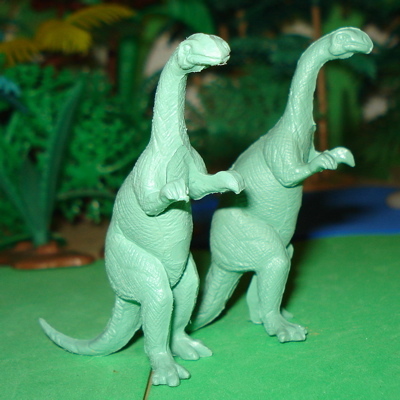 The Marx Plateosaurus is actually identical twin Dinosaur toys. 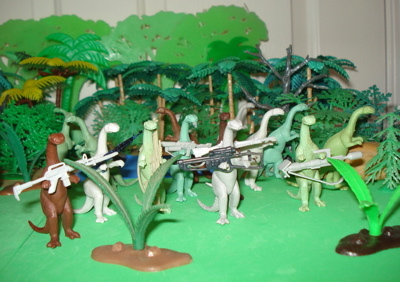 1955 was a great year for the Dinosaur toys fan. I recall it well. 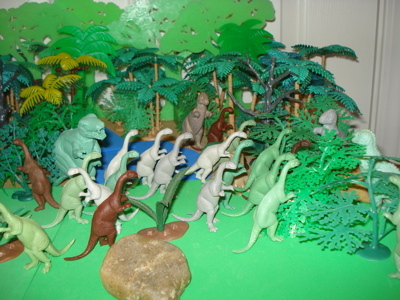 Prior to 1955 the Dinosaur toys horizon was relatively bare. Apart from the small number and limited range of SRG Dinosaurs there wasn't very much for me to play with in a Dinosaur sort of way. 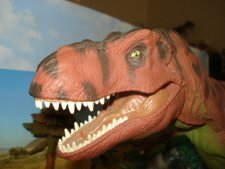 When the Marx toys company presented their new Dinosaur toys line that year I was ecstatic! 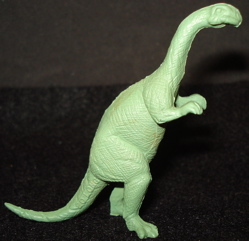 One of the least appreciated members of that lineup of fourteen is the Marx Plateosaurus. They made great prey and there were two of them in each mold cast. mmmmmm. Weighing In at just over a fifth of an ounce (1/5 oz, 6.5 gms) and measuring three & three-quarter inches (3.75", 9.6 cms) from nose to tail tip. Now Marx has these at twenty feet long (inscribed on right side of tail) making them 1/64 scale. 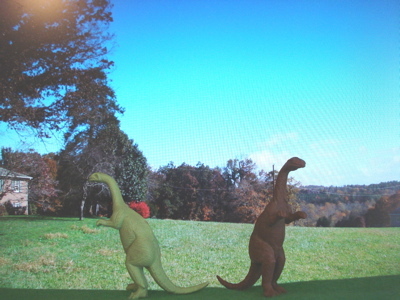 When you consider that current paleontology says that the Plateosaurus was 27 to 30 feet these are actually more in the neighborhood of 1/86 scale. 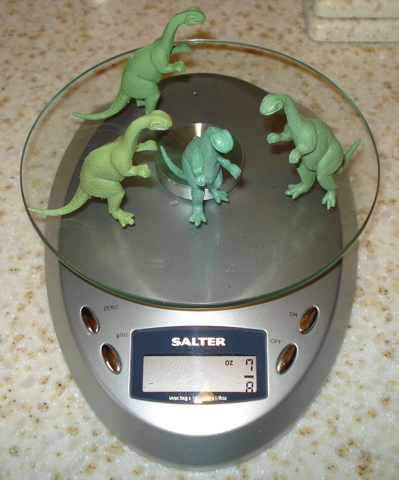 Of perhaps at least passing interest is that these, like their mold mate Marx Dimetrodons, have a clear "mold circle" on their bellies, at hip height. 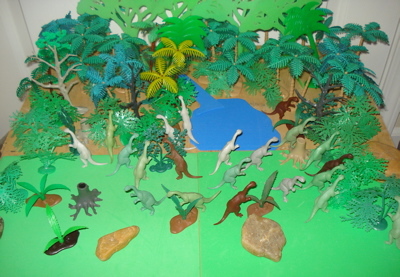 Most clearly, if not easily, seen below on the Plateosaur in the center. More easily seen in the two photos at the top of the page. 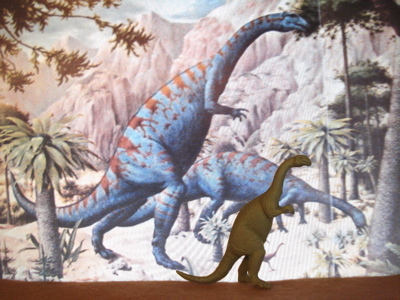 Based upon the famous Rudolf Zallinger "Age of Reptiles" mural in The Yale Peabody Museum (right) the Marx Plateosaurus was initially monochrome, coming in flat greens and grays (later browns as well). 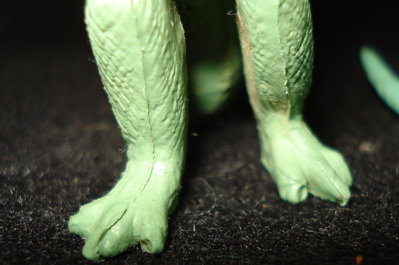 The detailing was excellent and the casting always very clean. Marx Plateosaurus: An endangered species?" 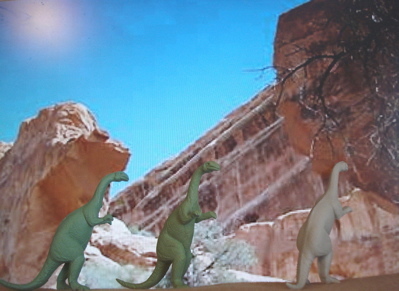 1959 saw a new Tyrannosaurus Rex in Dinotown. A much more svelte and dangerous foe (below). down on the farm (above right). 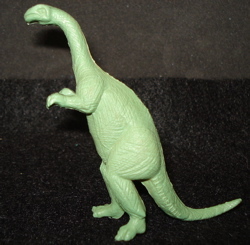 The Marx Plateosaurus was part of a seven figure mold that included two (2) Plateosaurs. 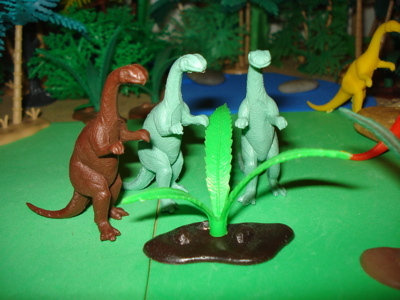 This has provided a plethora of Plateosaurs to survive until today. 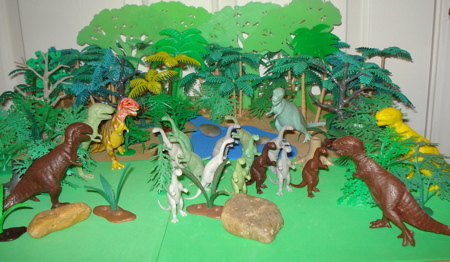 Despite the fact that the entire mold was lost in the early 1970s (and no Marx Plateosaurus has been produced since then) there are lots around. So yes, they are collectibles. No, they aren't that valuable. Four or five dollars (plus shipping) should get you one from an online auction although they are often included in small (and large) lots with other (Marx) figures. Get 'em while you can, which appears to be in our lifetimes and beyond. Do not be tricked into paying that much though, for an MPC Plateosaurus. 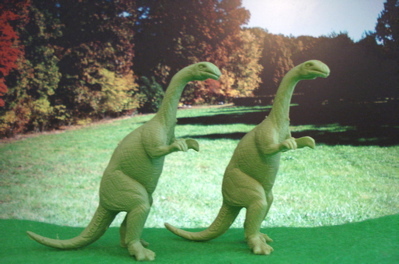 They look a lot alike (see my MPC Plateosaurus page for the differences) but the Marx figures' legs are more even, while the MPC is in full stride. The Marx are also in darker, earthier tones of green, gray and brown while the MPC tend to be bright, bright shiny plastic- reds, greens, blues etc. 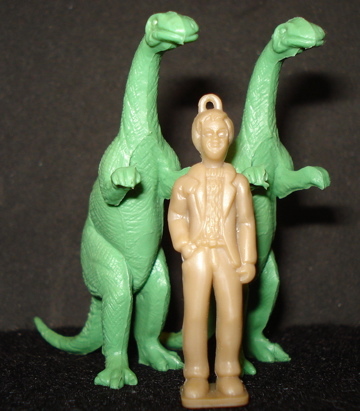 Now there are some Marx Plateosaurus that are more valuable. If you can find them as part of a color-matched mold group with the other six mold members (Cynognathus, Dimetrodon x2, Sphenacodon & Triceratops) you have a valuable set. Or if you find one in odd colors- sky (Robin's Egg) blues, aqua-greens or mottled you are looking at a more valuable piece. Many of these come from the "dump" and were once retail rejects, dug up by plasteontologists. Others were purposely created as mottled figures. 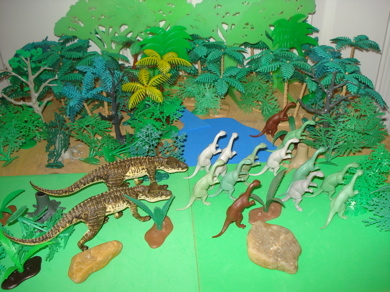 The Marx Dinosaur toys have a colorful history. Please use this link to leave the Marx Plateosaurus page and return to our main Plateosurus page. 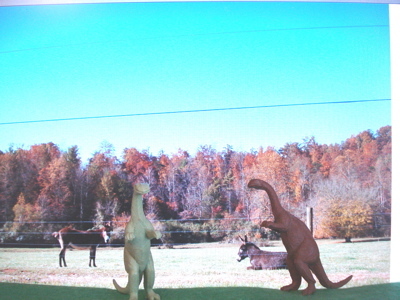 You can find out more about the Plateosaurus itself and the other Plateosaur Dinosaur toys there. Thank You.